HOWYWOOD KINDERGARTEN! 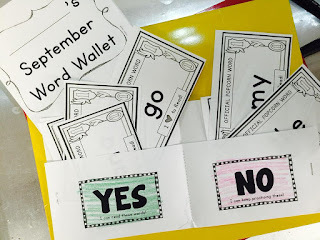 : Line Up Words, Word Wallets and a FREEBIE!! Making Popcorn Word Practice FUN! 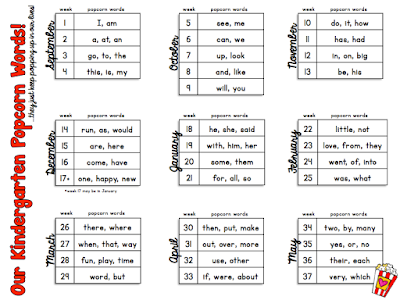 Line Up Words, Word Wallets and a FREEBIE!! Making Popcorn Word Practice FUN! 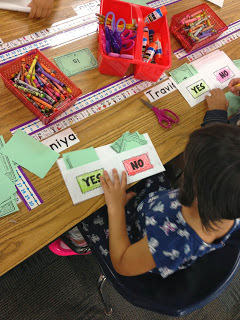 Sight words, Dolch words, Fry words, Popcorn words, word wall words.... whatever you call them in YOUR classroom, teaching kids to recognize, read, and write those commonly occurring words is a big part of Kindergarten life! Hi! If you're new here, thanks for stopping by! I've been teaching Kindergarten and 1st grade for the past 15 years and have seen a lot of cool ideas. I wanted to share just a few of them with you today as I link up with the other awesome Kindergarten teachers from "I Teach Kinder!" Yay! Where, oh where, to put those words?! Usually I've had a huge word wall that takes up a lot of space, but this year I tried to think outside the box and do something different! I took the huge space and made it into this colorful, easy "WOW Work" display and decided to just pop my words above the alphabet at the front of the room we refer to everyday! I'm liking it so far because everything is in one place. I DO have to stand on a chair to put them up there, but it's no big deal. If you're wondering WHAT in the world that is next to the "how," it's my little sticker school picture. So if they forget the word, they can always think of Mrs. HOWard! Ha! Dark backgrounds are GREAT for making your words stand out! Resist the urge to laminate your words! Yes, I know we want them to last FOREVER, but laminating can cause a glare with the lights and make words trickier to see. Mine are printed on cardstock and taped up with scotch tape (I have concrete walls! Yikes!) and they're hanging in there just fine on the 4th year or so of using the same words. Post new words of the week in a special place (you can kind of see mine towards the bottom of this pic) and move them up to the wall after the week is done. Awesome Idea: Line Up Words! This is a NEW idea for me, shared from a teammate who got it from one of her old teammates! Don't you love how teaching works? She said when she first heard about it she was like, "Oh, man. That sounds like too much work!" But once she actually tried it, it was not bad at all. I totally agree. Each child is assigned a specific word that is THEIR word for however long you want. 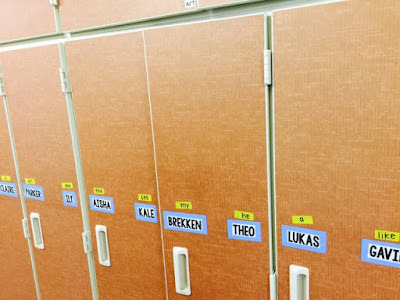 Post their word by their name somewhere... like their name tag on their table/desk or here is a picture of how mine are displayed on lockers in the classroom right next to the place where we line up. Ideally, you should assign kids a word that's difficult for them so they can really get to know something NEW. Kids can see which word belongs to them this week. Next, use tape to put words on the floor. I used a sharpie marker with colorful masking tape on tile, but my teammates used colorful duct tape on carpet.... so whatever YOU have, you can make it work! Not a great picture and these words have been stepped on for a month or two so they're a bit dirty... but you get the idea. I think they'll last long exactly long enough until it's time for me to switch up all the words! Score! 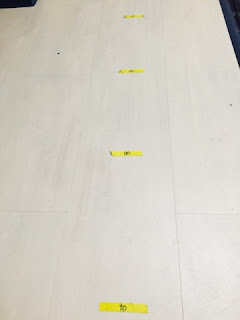 Words are written on tape on the floor about 18 inches apart. Switch the words out every week or couple of weeks or anytime you feel like majorly freaking your kids out... haha! You know they love that kind of stuff... "We got new line-up words?! Oh my gosh... what's mine?!" Assessment... How are we doing? This valuable info will help you figure out who needs certain line-up words AND it can really inform and direct your teaching. Another Winning Idea: Word Wallets! Okay, who doesn't love money?! Once a month I tell my kids they're worked so hard on learning their words so today is PAY DAY! Whoop, whoop! Of course they cheer!! I give the kids 3 pages of money. 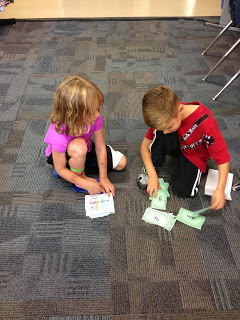 On each "dollar" is a word we've worked on this month. 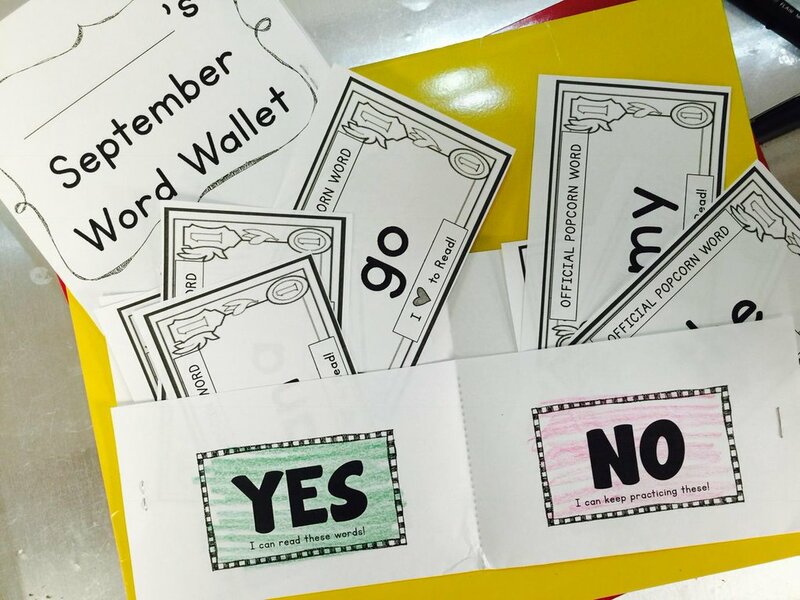 Kids cut the dollars out, try to read the words and put them into their "word wallet." No pressure to make your dollars green... sometimes I do, but usually I don't and it's still just as awesome. The wallet has a "YES... I can read these words!" side and a "NO... I can keep practicing these words side!" Kids often like to color those sides red and green. And you'll be happy to hear they are always REALLY honest with themselves. It's sweet. Mine are fun and fancy, but you could TOTALLY make word wallets with strips of paper for dollars and just fold and staple some paper to make your wallet- easy cheesy! Next, I have them get with a buddy and read their words to each other. They can help each other out on words that are tough. After that, they put their wallet in their folder to take it home. Parents love these because it's another simple tool they can use at home to really help their kiddo learn those words fast! Many years ago, I got frustrated with the order our curriculum was suggesting we teach sight words. It was super random and one of those times an experienced teacher needed to step up and say, "Wait a minute... we can do better!" So I decided to re-work the lists to put them in a different order, beginning with the most commonly occurring print words first and holy cow! It REALLY made a difference! My kids are learning their words faster than ever. And THEN guess what happened next?! They're reading faster than ever since these words pop up so often in books! It's like magic and so, so fun (for me AND them)! 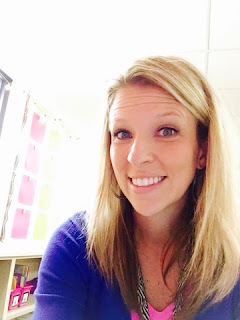 I'll share my list with you here... it includes 78 of the first 100 Fry words, well over half of the beginning Dolch words, and I bet it includes most or all of the Kindergarten sight words your district wants kids to learn. * all the fancy assessments you saw in this post and 2 styles of helpful tracking sheets! Thanks for reading all my ideas on how you can help make learning words FUN in Kindergarten!